Seriously though, Bamburgh Castle is no figment of the imagination, although it’s so magnificent that it is hard to believe it’s real until you see it for yourself. Perched high on an outcrop of Whin Sill, the same rock that forms the most spectacular sections of Hadrian’s Wall, it dominates the landscape and is a focal point for photographers and historians alike. 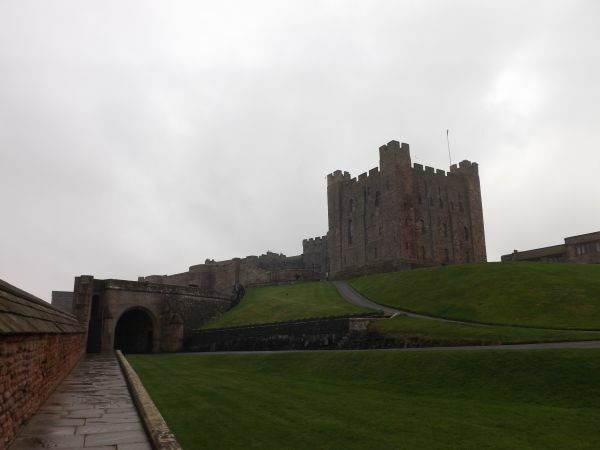 True to form we’d chosen a damp misty day for our visit to Bamburgh, but the castle was still an awe-inspiring sight as it appeared from the mist on our drive from the A1. One of the first things that greet you as you enter the castle is a sign. ‘The King of Castles’ and that is no idle boast, it is indeed a king amongst all the magnificent castles that Northumberland is blessed with. There has been a fortification on the site since at least the 700s and possibly even earlier, and looking down from the ramparts it’s easy to feel sorry for any medieval force attacking the castle. If you’ve read any of our previous blogs you’ll know that one of the first things we do on arrival anywhere is go for coffee and scone. 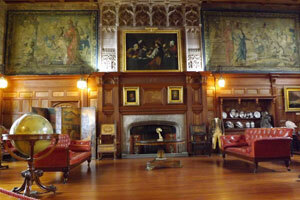 As by now it was raining it was an especially good idea to seek shelter in the tea rooms and enjoy our scones. By the time we’d eaten, the State Rooms were open and this was another way to get out of the rain. The State Rooms are not only magnificent, but also reflect the many and varied uses that the castle has been put to over the years. The amount of treasures on display is phenomenal and they are shown in a way that allows one to imagine what life was like during different periods of time. It would take a much longer blog than this to list all that is to be seen, so I’ll just detail a few of my favourite things. Obviously, the superb views all around and the sweep of beach and dunes. There are good views of Holy Island and the Farne Islands, so we were told but the mist hid them from us. The castle itself from every angle and viewpoint and the immaculate upkeep of it all. The King’s Hall with its magnificent 300 ton teak ceiling and sprung pine ballroom dance floor. At the end of the King’s Hall the Cross Hall with its striking fireplace which could be separated by folding doors for more intimate family living. The stunning collection of weapons in the Armoury took my breath away, so much in one collection is hard to believe. The scullery with its row of old sinks, the secret door with stone steps leading upwards, and although there is not much to actually see, we marvelled at how the well was constructed all those years ago. Outside the Victorian stables are impressive and the Armstrong Museum gives details of the many and varied achievements of the 1st Lord Armstrong. One visit was nowhere near enough and we will return to see Bamburgh Castle in the dark, at sunrise, at sunset, with snow on the ground and everything in between. Keeping with the Bamburgh Castle theme we drove the two miles south to Seahouses for lunch at the Bamburgh Castle Inn. Now we are not normally ‘lunch out’ people but we were very glad that we made an exception. We sat at a table in the big picture window with a great view of the harbour, and joy of joys, the sun came out and lit up the scene before us. Sitting watching the comings and goings in and around the harbour, we rather hoped that the service would be slow so we could just sit and watch. However, the service was very efficient and extremely friendly, but we took our time to enjoy the ambience anyway. We shared a starter of potato skins, and delicious though they were we were glad we did as the portion was so large it could have been a main course. For mains we each had fish, chips and mushy peas which were every bit as good as the skins. We chose the ‘light lunch’ version which to us seemed much more than a light lunch. We did see the dinner version of fish and chips being served and have to say that it was so large we could have shared it between us and we would have still been full. Although we didn’t really have room we had to try the ‘Spurreli’ ice cream, being a locally made ice cream that we hadn’t yet tried. It’s delicious. 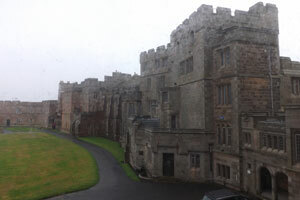 The Bamburgh Castle Inn is really, really nice, well set out and spacious and in a superb position. It’s an inn in the traditional sense in that there are en-suite bedrooms and we were so taken with the place that we plan to spend a night there in the near future, probably taking advantage of the Dinner, Bed and Breakfast Winter Special Deal.